Permaculture began with the concept of edible polycultures with Mollison and Homgren’s observations of natural ecosystems. Their initial idea looked much like a young emerging woodland with a mixture of trees, shrubs and herbaceous plants, all of which were edible or useful to humans. Forest gardens are becoming increasingly popular and people are growing accustomed to the idea of edible perennials. But a polyculture doesn’t have to consist of only perennials. There is room for self-seeding annuals and planted vegetables in and alongside a forest garden. 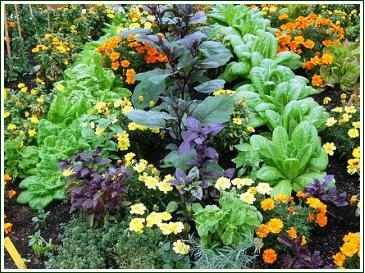 Or you can simply create a polyculture within your annual vegetable garden. Here are some good reasons for growing annual vegetable polycultures and a few helpful tips for having a go. 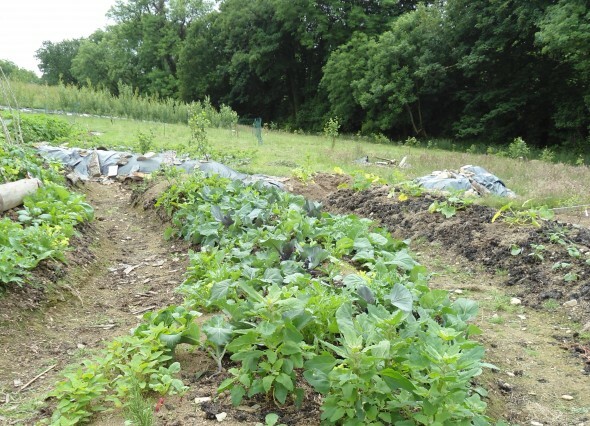 All of the benefits of a diverse system will apply to your annual polyculture. The most important one perhaps is the improvement in the health of the plants and the soil. Pests and diseases tend to be species specific – that is they like to prey upon one type of plant. Club root for example is only found in the brassica family of plants; cabbages, kales, cauliflowers, broccoli, etc. Black fly colonise broad beans and carrot fly only eat…well you get the idea. As well as being unimaginative with their diet, pests are also easily flummoxed and less likely to find your crops if they are part of a polyculture. In nature you rarely see explosions of pests and diseases as they are kept in check by the challenge of finding their prey and being preyed upon themselves. Taking care of your soil will make a big difference when it comes to controlling pathogenic microbes, but mixing up your crops in the growing area will help to confuse the flies, bugs, beetles and other invertebrates which are looking for lunch. By including flowering plants which attract predator insects you can help to keep damaging bugs like aphids, white fly and black fly in check. These can be either included in plant mixes or grown around the polyculture beds. Angelica, chervil, dill, fennel, hogweed, lovage, sea holly, sweet cicely. Cornflower, corn marigold, fleabane, golden rod, Michaelmas daisy, ox-eye daisy, Shasta daisy, yarrow, tansy, chamomile. Winter flowering heathers, wild marjoram, spring flowering willows, Melissa, comfrey, borage. 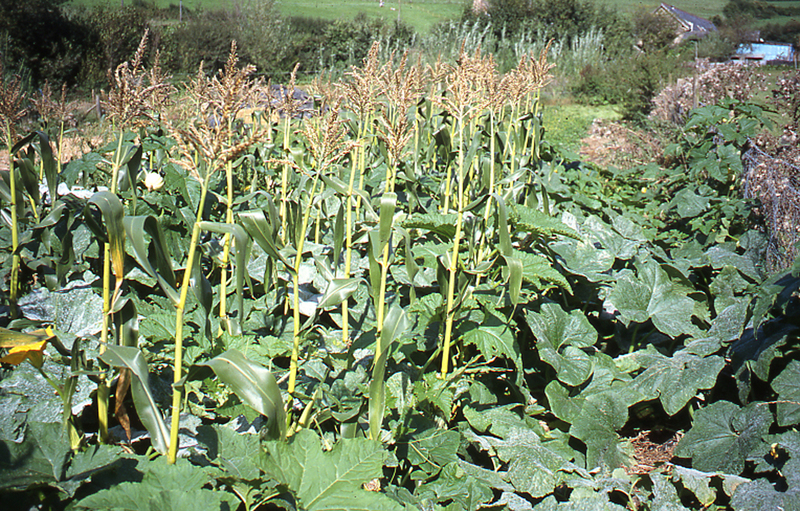 A well designed polyculture can easily out-crop a monoculture if managed well. Each crop included must occupy a different niche. For example their specific root depth, light requirements, water and nutrient needs, seasonality and growth rate. Rather than competing with one another they will co-exist harmoniously, and ideally actually benefit one another. Some classic examples are lettuces around purple sprouting broccoli with a ground cover of radish. The lettuces make use of the ground between the PSB while it slowly fills the space over the growing season. As it grows more leafy in the summer it will cast a little shade on the lettuces and prevent them from bolting. Meanwhile any remaining gaps can be filled with fast growing radishes which will crop before the gaps are filled by the other two crops. Radishes can also be sown with parsnips. As parsnips are slow to germinate the radishes come up quickly enabling the gardener to see where the parsnips rows are, and thus avoid hoeing or weeding them – so a polyculture can be as simple as you like, so long as it has some benefit. Growing two crops together can out-yield a monoculture by up to 150%. The more plants you add, the lower the rise in overall yield, but it will still always be more than a monoculture because of the different niches being occupied. The better the design, the better the yield. As the plants grow much thinning is required and a constant level of attention to ensure plants have enough space and are not competing. Harvesting is fairly constant and plants are often picked when small or young to make room for other crops. Gaps from harvesting can be filled with seedlings for the next succession of crops.Ianto Evans (Cob Cottage) and Sepp Holzer (Hugelkulture) both broadcast seed mixes on to open ground. Evans advocates broadcasting each type of seed individually at a normal rate, while Holzer broadcasts mixes. The plant mixes or ‘guilds’ are chosen according to the different needs and qualities of each plant. You may choose to either broadcast seed, raise seedlings to plant out, or a combination of the two. I raise most things as seedlings as we have a serious slug problem. Remove any surface mulches in the spring and only mulch with compost if you have a lot of slugs. When designing the polyculture crops can be sorted into different groups according to their needs. For example, choosing the most demanding plants as the main crop with less demanding plants around them. Some smaller non-demanding crops can be useful as space fillers and at the edges, like spring onions, radishes, garlic, thyme, parsley or flowers like French Marigold (Tagetes) or Pot Marigold (Calendula). If you’re trying to get more out of your soil you will need to put more in to it, so make sure it gets plenty of compost – 2 or 3 times more than usual depending on how demanding the crops are. You can also use liguid plant feeds like nettle tea and comfrey juice to make sure everything grows abundantly. Growing a polyculture takes a little more care and attention that growing a monoculture, but it doesn’t need to be complex and the rewards are well worth the effort. You should spend much less time weeding, hoeing and dealing with pests and diseases, and more time harvesting and eating! Every garden is different and what works in one may not work in another. Be prepared to stray from the plan and make best use of what you’ve got as the season progresses. Sow/plant densely and thin out if the slugs don’t do it for you. Don’t over-seed as you’ll create too much competition. Sow each crop at the recommended rate for the area. Use shade to your advantage to prevent bolting or hold back crops. This can be useful if you’ve sown too much in modules but don’t want to waste seedlings. 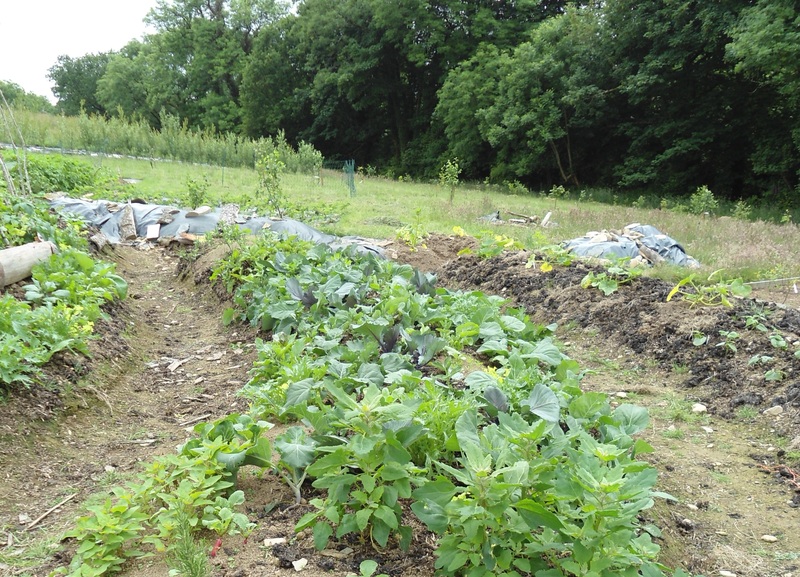 Some crops work best in fairly big blocks, eg: squash takes over, brassicas need netting. You can still get other crops in though – sunflowers work well through squash. Leeks need a good groundcover that isn’t too thirsty, like parsley for example. Can also be planted in groups of three in the large spaces between young courgettes- the shade can help to blanch the stems. Use plenty of rapid shallow-rooted ground cover crops to make sure ground isn’t left bare, eg: salads, spinach, rocket, radish. Sow/plant plenty of self-seeding companion plants which will come back and compete with weeds. If you see a gap, fill it with something useful before a weed finds it. Harvest quickly, don’t wait for plants to mature. Pull out by the roots to make way for next crops. Don’t use too many crops if you don’t have the time to maintain it. Make sure you’re adequately feeding the soil to account for the extra productivity. Plenty of compost, liquid feeds and teas. While the beds will lose less water from evaporation from the soil (it will be covered with foliage) there will be a higher demand from the plants in warm and windy weather. Look out for signs of wilting.